The homepage announces current news related to infrastructure, pipelines and economic development projects that employ union labor. 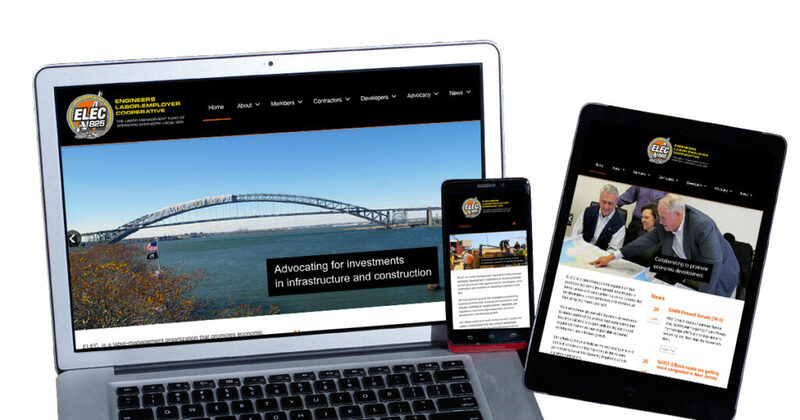 Mobile and tablet users will notice the site displays perfectly on their screens and is user friendly on any device. And of course, it is still perfect for desktop visitors. Members of Local 825 can apply for reimbursements easily for eligible licenses and credentials by using the “Members/Reimbursement” tab. Contractors can register to gain access to Market Recovery grant information, as well as a Contractor Toolkit of professional services and links by clicking the Contractors tab. Developers can get services and support for their projects, by clicking the Developers tab. An Advocacy section Reports on what ELEC825 is doing in Trenton, at regional Chambers of Commerce and with business and trade groups to support infrastructure, pipelines, and development. We hope our new site makes it easier to get the information and help you need. Check back with us regularly.